Snowy peaks rise up in one direction; boggy tundra spreads across the other. Fuzzy heads of long-stemmed plants sway in the wind, interspersed with bog blueberries. This is Alaska's Eight Mile Lake, where the nearest town has a population of just over a thousand people. 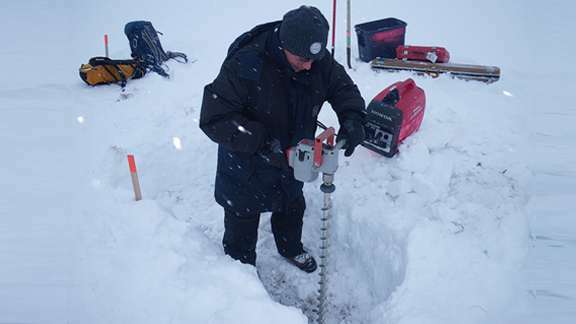 Researchers supported by the Department of Energy's Office of Science are visiting here and other remote locations to study how permafrost – soil that's frozen for consecutive multiple years – thaws. Because soils in high latitude systems where this happens store almost twice as much carbon as the entire atmosphere, figuring out the thawing process is essential to modeling terrestrial ecosystems and climate. Improving Earth system models can help scientists better understand the likely extent and effects of future climate change. Permafrost's deep layers act like the world's ice chest, locking away organic matter such as dead plants and animals from degradation for thousands of years. The cold temperatures and waterlogged soil slows decomposition to a near halt. But today the Arctic is warming at a pace that hasn't occurred for the past three million years. Rising at a rate twice as fast as the rest of Earth, the Arctic's average temperature could increase by as much as 14° F between 2081 and 2100. 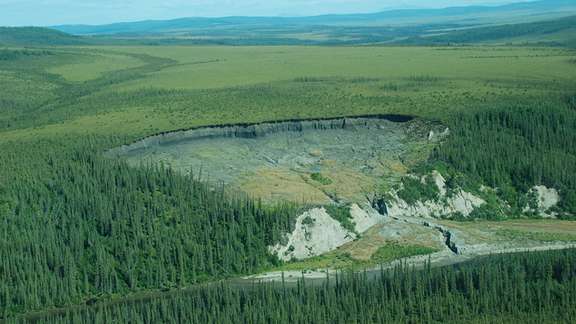 Organic matter in thawed permafrost can decompose rapidly. As bacteria, fungi, and other tiny organisms break down the matter, they release the greenhouse gases carbon dioxide and methane. Every 1 degree C (1.8 degree F) increase in average global temperatures could result in permafrost thawing enough that it releases a year-and-a-half's worth of human-made carbon dioxide emissions. Greenhouse gases from the thawed permafrost would lead to more climate change, which then could lead to more permafrost thawing – a self-reinforcing cycle. "This is the most important tipping point," said Jizhong Zhou, a researcher at Lawrence Berkeley National Laboratory (LBNL) and professor at the University of Oklahoma. That's where field and laboratory research come in. Before 2012, permafrost researchers and climate modelers usually worked separately. But through the Next-Generation Ecosystem Experiments Arctic (NGEE Arctic) project, teams from DOE headquarters, DOE national laboratories, and universities brought together field, laboratory, and modeling researchers to share their needs and expertise. "This is a level of dynamics and interactions that we just haven't had in the past," said Stan Wullschleger, NGEE Arctic director and a researcher at Oak Ridge National Laboratory. "[These collaborations] make for a much more informed, richer discussion about how field, laboratory, and modeling scientists can interact." While it seems as if summer would affect permafrost the most, it's actually winter warming that causes thawing. One major study supported by the Office of Science found that although summer conditions didn't warm the soil, winter warming increased soil temperatures by 3-5° F. After only three years, these changes led to a 45 percent increase in respiration, the process that produces carbon dioxide. There were some increases in plant growth and uptake of carbon dioxide, but it wasn't nearly enough to offset the releases. Changes in water movement also could accelerate thawing. Currently, wedges of ice make up one-fifth of the upper layer of permafrost. These ice wedges are so foundational to the landscape that when they melt, the ground actually collapses. The resulting shifts can connect troughs and lakes so much that they drain out, transforming the ecosystem's water distribution. A study by NGEE Arctic found that temperature increases of as little as 9° F can cause ice wedges to cave in within 15 to 20 years. And they don't have to be changes in average temperature – an unusually hot summer can kick-start the process. "It's a transformation that's not easily undone. Certainly not in our lifetime," said Sue Natali, a permafrost researcher at Woods Hole Research Center. Watching the landscape shift is enlightening, but field work alone can't describe the underlying processes. Bringing samples back to the laboratory allows researchers to isolate specific variables. Because melting ice wedges could cause major changes in water distribution, it's essential to know how decomposition could vary depending on the soil's water level. One NGEE Arctic study discovered substantial differences between decomposition in dry soils with oxygen (aerobic) and waterlogged soils that don't have oxygen (anaerobic). Researchers found that dry, aerobic soils released twice as much carbon dioxide and methane after thawing than waterlogged, anaerobic ones did after thawing. Microbes, such as bacteria and fungi, are another major focus of lab research. Various studies have examined which of these tiny organisms are most common in permafrost before and after thawing and compared the difference between microbes in different layers. One study supported by the Office of Science found that after only 18 months of warming, the microbes' respiration that produces carbon dioxide increased by 38 percent. These field and laboratory observations are making climate models more accurate than ever before. In fact, the first-generation models didn't include permafrost at all. "The realization that the models were missing the single largest pool of carbon was a real driver of what we've done since then," said Charlie Koven, an LBNL climate modeler. Using much of this data, a climate model supported by the Office of Science shows that if climate change continues at its current rate, half of the world's permafrost could thaw by the end of the century. Whether researchers are measuring snow in some of the most brutal places on Earth, thawing soil in a laboratory, or examining a computer screen, each contributes to our understanding of the Arctic's vast stores of carbon. "[NGEE Arctic] was and continues to be a great example of how the national labs can interact," said Wullschleger. "This kind of an [approach] just really accelerates improvement of climate models."